"I'm really good at giving kisses. Every night I make sure all the animals get a good-night kiss. Then they can sleep tight." 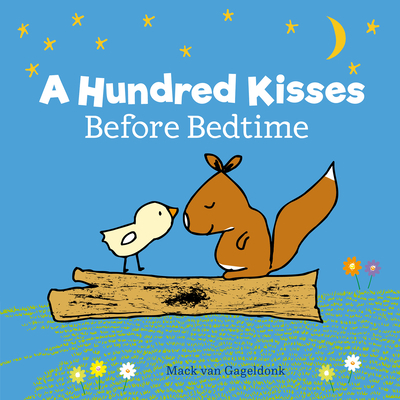 A sweet and endearing bedtime book. For good-night-kiss-givers ages 12 months and up, with a focus on the child's world. Mack (1960, the Netherlands) is a graphic designer and illustrator from The Netherlands. He was educated at the Royal Academy of Art in The Hague. During his education he made funny and educational cartoons about, among others, penguins and whales. These cartoons were later bought by the 'Diergaarde Blijdorp'-zoo in Rotterdam. By now Mack is a regular illustrator at this animal park and he is the author of several children's books, in which animals often are the lead characters. Mack has a primitive way of drawing. He gets inspired by African art and the paintings of the Australian aboriginals. Both create a immense power by simplifying shapes. Mack wants to combine that powerful simplification with a subtle sense of humour. "In my books I try to teach children something in a funny way," Mack says. "If I draw a penguin, it doesn't matter to me that much how pretty he is or how good of an swimmer he is. What I want to show the most is how baggy he stands on the ice and how funny his walk is. That funny bagginess is what I try to catch in a couple of lines. Only when children can laugh about it, I think to myself: 'Yes, I did it'."